GrabHitch Warmly Welcomes The SwiftBack Community! GrabHitch welcomes all Swiftback drivers to join the GrabHitch community! As a Swiftback driver, you’ve enjoyed cost-savings and social interactions while sharing rides as a Swiftback driver. Now you can share your ride and be part of GrabHitch’s up and coming social carpooling community! Our drivers come from all walks of life and many are regular morning/evening commuters just like you. GrabHitch is a social carpooling service on the Grab Passenger App that matches regular commuters from the entire Grab base to GrabHitch drivers who are heading the same way, at the same time. As a driver with seats to spare, GrabHitch helps you to share your costs and a ride. Anyone with a valid driving license can sign up under 5 minutes – right from any mobile device. There is absolutely no additional registration involved, nor any obligation to do rides on a regular basis – you choose who to pick up and when to do so. Drivers can see passenger routes similar to their own journeys and filter them based on (a)Distance, (b)Fare or a combination of both. Alternatively, our QuickHitch feature allows drivers to see passenger bookings near their location even without creating a route. We run monthly driver incentive schemes too! For the latest December scheme offering up to $150 cash bonus check this link out. Signing up as a driver is easy, it takes less than 5 minutes! 2. Click on the BLUE Drive Icon to sign up as a driver. 3. Upload photos of your driving licence (front and back), a selfie and your vehicle details. 4. You MUST enter the referral code SBHITCH20 to get your $20 credit after you have completed your first GrabHitch ride as a GrabHitch driver! Your application will be approved in 1-3 working days. You will be notified and can start driving upon approval! Hassle-free Usage! Create and accept rides as a GrabHitch driver directly from the Grab passenger app! Simply toggle between driver and passenger mode – there’s no need to download an additional driver app. Find similar passenger matches easily! After you input your route, the Grab app will automatically display passenger ride requests that best match your set route in terms of timing and proximity to your start and end destinations. Never get paid less than what you deserve – GrabHitch ride prices are fixed; they are set by distance and unadjustable. 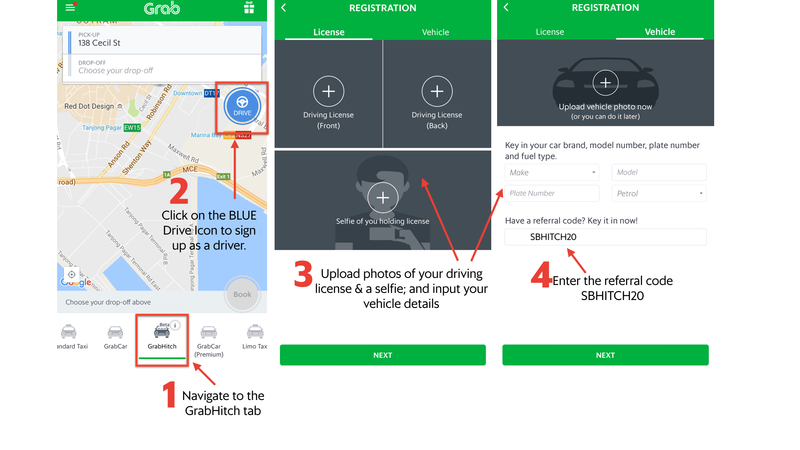 For more details on how to use GrabHitch, click on this post to find out 7 things every GrabHitch driver should know! This incentive is only eligible for new drivers who sign up and successfully complete ONE ride as a Hitch driver between 13th December 2016 @ 00:00 hours – 31st December 2016 @ 12:00 hours. New drivers must sign up with the referral code SBHITCH20 in order to qualify for the $20 credit incentive. The processing of the $20 credit incentive will only be conducted after the incentive period has ended (Post-31st December 2016). If you’re still not sure how to sign up, or have any questions regarding GrabHitch, email us at grabhitch@grab.com with the Subject: SBHITCH20 and we will get back to you in 1-3 working days.